WikiBranding: Seven universal stories all marketers should know. Seven universal stories all marketers should know. 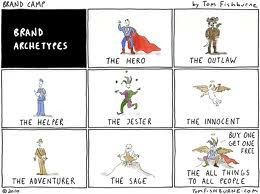 I've written frequently about the power of archetypes and storytelling in creating enduring branding strategies. After all, archetypal personalities tend to transcend time, cultures and geography. We are hard wired to understand the Ruler, the Jester, the Magician, et al. Defining a brand in archetypal terms will resonate more deeply with consumers than surface level "tone and manner" statements. As for stories, I think we can all agree that stories convey meaning, and in the media saturated world in which we live, meaning trumps information every time. This piece published in Adweek offers a very helpful insight into the seven archetypal plot lines told in literature and movies. Every brand marketer should know these time-tested narratives.